Being able to change your own strings on a Yamaha guitar like the Yamaha Idol will save you the time and cost of taking your guitar to a music store to have the strings replaced. In the end, knowing how to change your own guitar strings will help you understand the mechanics of keeping a guitar in top working order. Remove the low E string by unwinding it from the guitar tuning peg. This is done by turning the tuning key counterclockwise until there is enough slack in the string to pull the string windings off the peg. Cut off the portion of the string that was wrapped around the tuning peg with a pair of side cutters or wire cutters. By removing the bent and sometimes mangled part of the string away you limit the risk of old string scratching the guitar finish while pulling the string out of the stop tailpiece. Pull the string out of the stop tailpiece that is located directly behind the Tune-O-Matic bridge located on the Yamaha guitar. With the bent piece of the string cut off, the string should slide out of the hole in the tailpiece easily. Slide the new low E string through the hole in the stop tailpiece and then slide it into the hole of the tuning peg. There should be enough extra string to allow it to wind around the tuning peg three to four times. Turn the tuning key clockwise to allow the string to wrap around the tuning post. This should be completed until the string is tuned to the correct pitch. The string should be located on the right side of the tuning peg for the low E string, the A string and the D string. The G string, B string and high E string should be located on the left hand side of the tuning post. Repeat Steps 1 through 5 with each subsequent string. 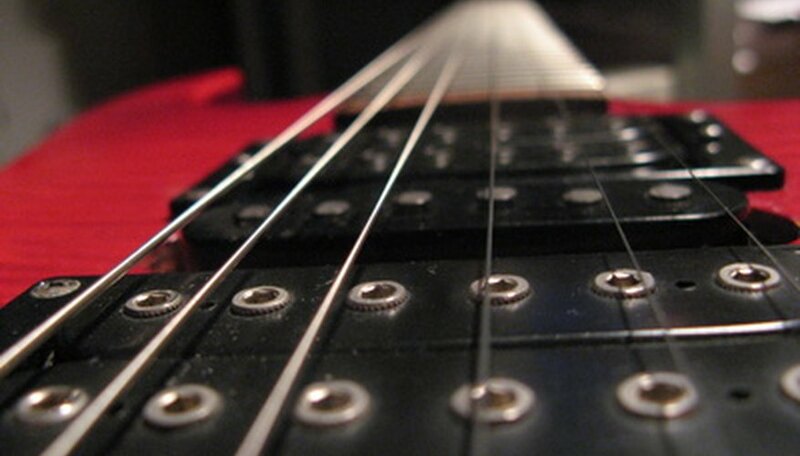 One string should be removed and replaced at a time to avoid uneven string tension on the neck. You should never remove all six strings at once when completing a string change. This can cause the neck to warp. When changing the strings its also a good time to wipe down the fretboard. With the string removed wipe the guitar fretboard with a high-quality furniture polish and a cotton towel. Do not cut the strings off the guitar while it is tuned to pitch. Sudden changes in string tension can cause a neck to warp which can cause permanent damage.